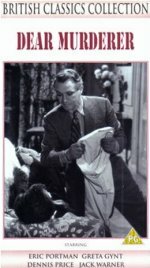 When a wealthy London businessman (Eric Portman) learns his wife (Greta Gynt) has had an affair during his absence, he murders the man. When he discovers she has a new lover (Maxwell Reed), he frames him for the crime . . .
A nifty but thoroughly unpleasant British thriller, in which the protagonists are so vile we can only rejoice when they get their comeuppance. Dennis Price and Jack Warner offer support; the stolid direction is by Arthur Crabtree.